Empowerment, a basic need to be able to work with dignity, has often been unfulfilled for many of the women entering WAR, Int’l programs. These women need to know that they are a valuable part of their individual societies. Sometimes, all they require is an initial investment in their futures, and, through WAR Int’l, we are able to provide them with micro-loans to help them become self-sustaining businesswomen. WAR Int’l has a deep desire to see women employed with dignity in safe environments and become financially stable. Micro-loans enhance that desire for us, which is why we believe so firmly in their effectiveness. According to World Vision, it has been proven that women have the highest micro-loan repayment rate, and they also consistently invest the most of their earnings in their children and families. Many of the at-risk women we work with all over the world have no way to provide for themselves. But with a small micro-loan, they are given the finances they need to start a business. More importantly, these opportunities give them dignity. Micro-loans are not handouts – they are a hand up. WAR Int’l supports partnering micro-loan organizations all over the world to make sure that women have the opportunity to support their families while making an income. What sets most of our partners apart is the fact that many times these micro-loans are also coupled with educational classes, business classes, and Bible classes. We’ll be honest; when it comes to choosing partners, we are picky. There are thousands of organizations giving micro-loans to those in need. However, we make sure life-change is happening, outside of the financial realm, for these women before we choose to partner. Micro-loans have been the saving grace for many women and their families. Take Myra, for example. Myra was a salsa dance teacher in the Dominican Republic. Each morning, she left her three children at home so that she could teach dance. However, after learning that her oldest daughter had been raped by the apartment’s janitor, Myra knew that she had to create a circle of protection – first and foremost – around her three children. Through a micro-loan, Myra now runs a food stand selling empanadas. She is able to be with her children while making an income to support her family. She was even able to continue dancing by starting a salsa aerobics class at her local church! If you would like to donate to WAR’s Micro Enterprise fund, click here. Though micro-loans are extremely important, women in some countries benefit more from a single, one-time gift. At WAR, Int’l, we have a program called the Goat Project. Currently, the Goat Project works in three different countries: Sudan, Nepal, and Kenya. The goal of this program is to provide women who need a source of income with goats, because in many countries, if a widow does not have a goat, she has no means of supporting herself or her family. So, while WAR, Int’l is very passionate about micro-loans, we also understand the importance of meeting specific needs. 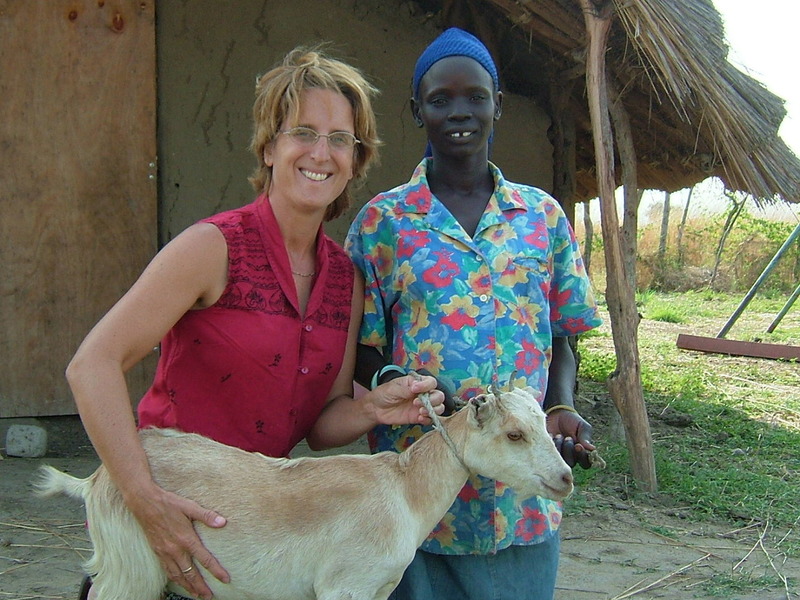 Instead of a micro-loan, this program includes a goat-loan. The goat is loaned to an at-risk woman who will raise it and use its milk to feed her family. She can also sell this milk to make an income. All WAR Int’l asks is for the woman to return to them the first female kid the goat has. In doing this, we are able to provide a goat to another woman at risk, creating a self-sustaining cycle in vulnerable communities. Read more on our Goat Project program page. When women are provided with the basic necessities to support themselves, we help them to create an environment of empowerment in their communities. According to World Vision, violence against women decreases where women are self-employed – and we have seen this first-hand. Please pray for the success of the businesses that these women have created, that the micro-loan program will be able to expand through WAR, Int’l and that the Gospel will be spread in mighty ways. We’re not just giving financial investments and stability to these women, but we’re giving them the opportunity to invest in their eternities as well. We don’t take this lightly, and we hope you’ll pray with us and for us as we continue to give more women opportunities that once seemed so out of reach for them.